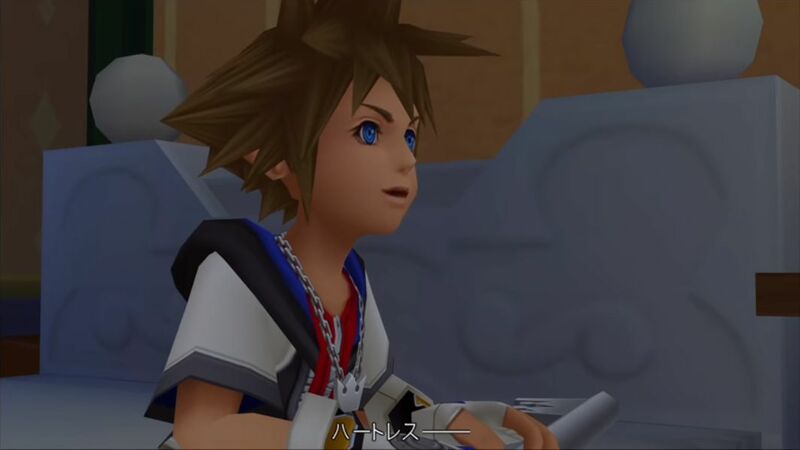 Basically, in the English translation of Kingdom Hearts , Sora is already speaking fluent English and the target audience already knows English too. Two languages were used in the original script, but the translation only uses one language. 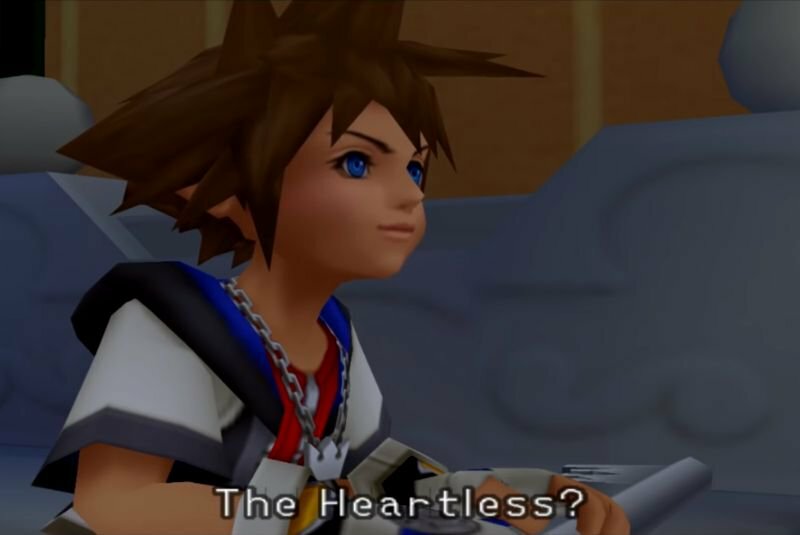 As a result, explaining what “heartless” means in English here comes across as redundant and somewhat silly. "People die if they are killed..."
"I couldn't die even if I were killed here." 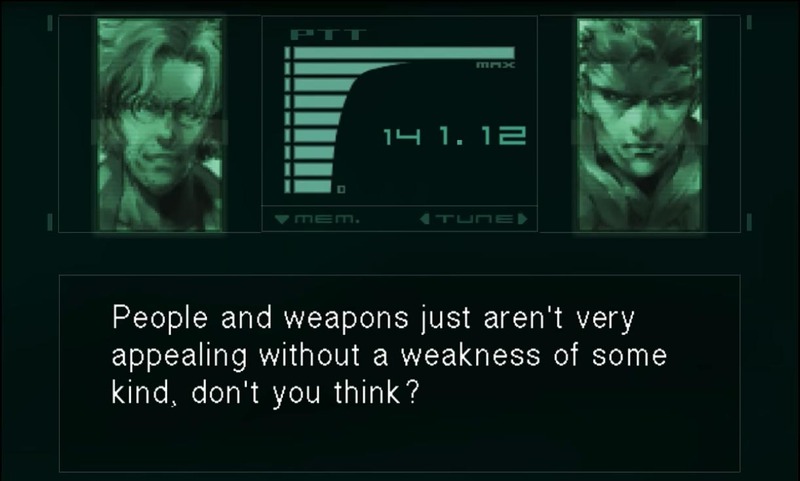 Another type of translation redundancy appears in Metal Gear Solid , which has received two separate English translations: one for the original PlayStation and one for the GameCube remake. 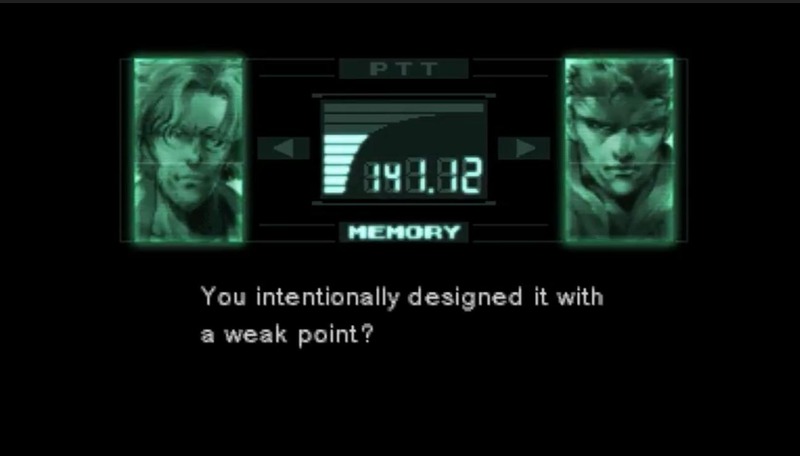 "You intentionally designed it with a weak point?" 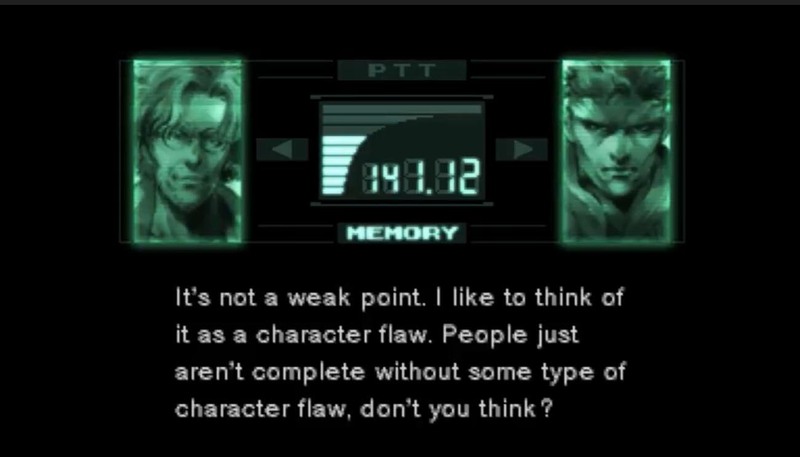 "It's not a weak point. I like to think of it as a character flaw. People just aren't complete without some type of character flaw, don't you think?" 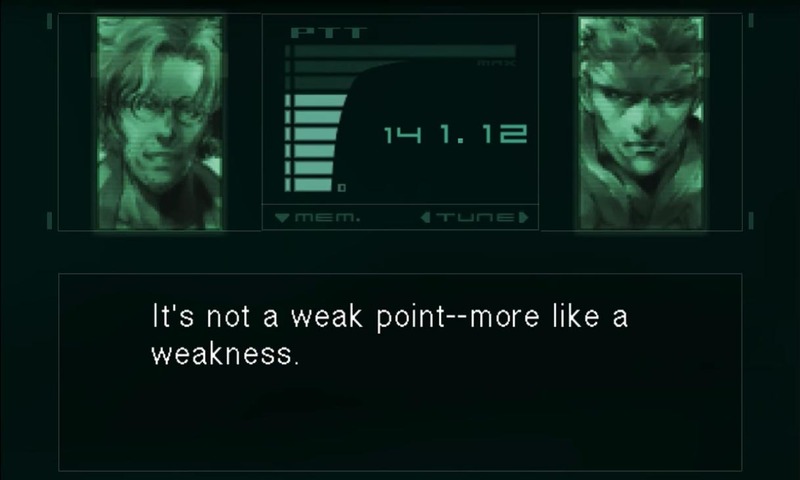 "It's not a weak point-- more like a weakness." "People and weapons just aren't very appealing without a weakness of some kind, don't you think?" I originally had another example here from the Fate series, but I feel I did an unsatisfactory job with it, which greatly distracted from the main point of this article. I’ve taken it out, but I’ve left a copy of it here if you’re interested. "When you have a birthday, you celebrate being born." "Death Note... 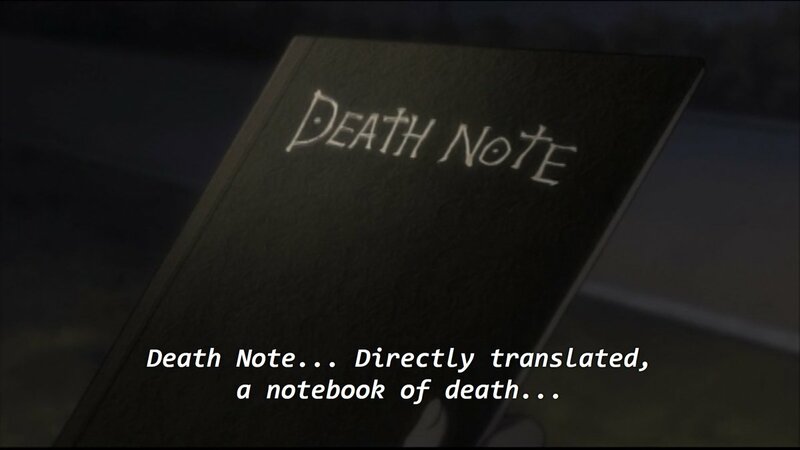 Directly translated, a notebook of death..."
"So this is the power of The Power!" 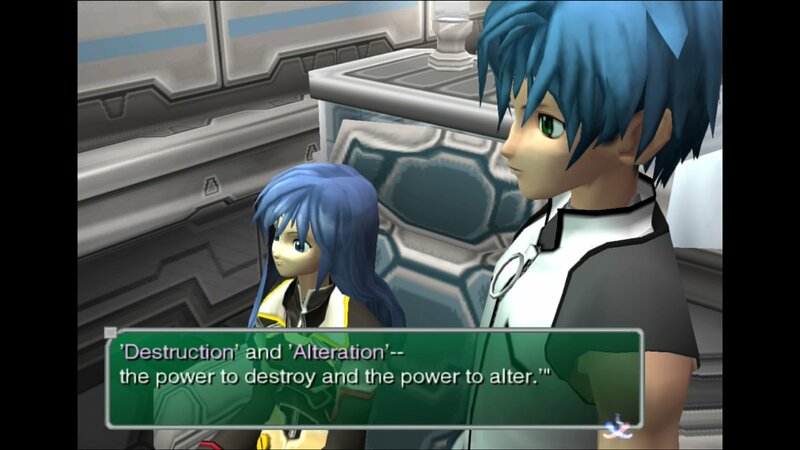 "'Destruction' and 'Alteration'-- the power to destroy and the power to alter." "My father? You mean my dad? You know my father!?" "A sorceress. As a sorceress, she is well-versed in magic. 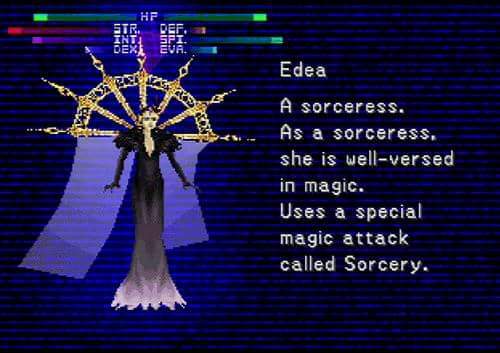 Uses a special magic attack called Sorcery." 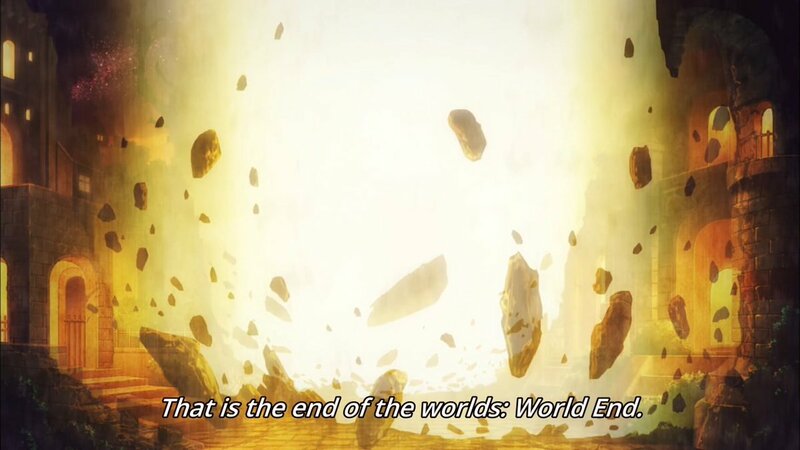 "That is the end of the worlds: World End." 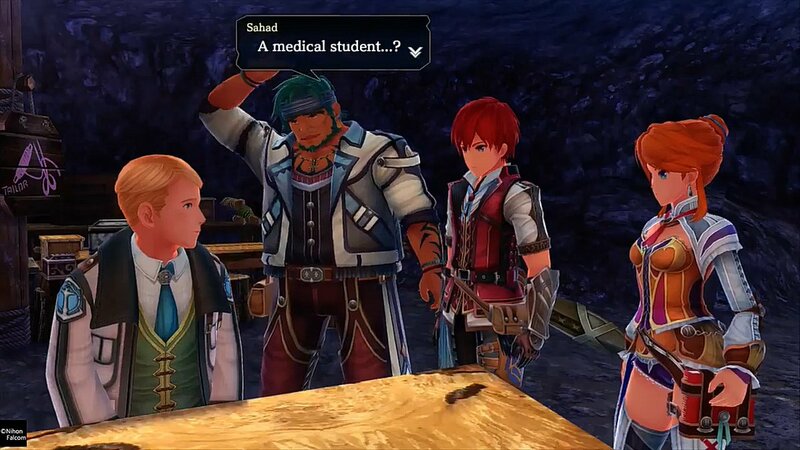 "That's a student who studies medicine." 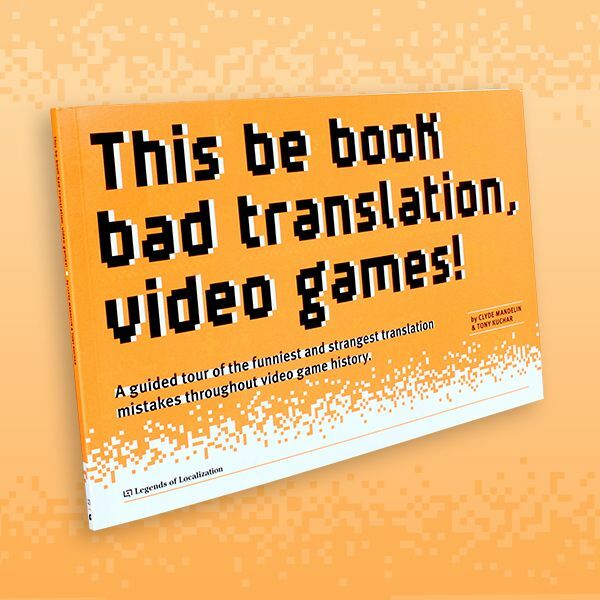 If you want to see more insight and thoughts on redundant translations from other translators and fans, check out the full discussion thread here! In the manga and anime Loveless, characters have “true names” that are English words. The translations get a liiiittle awkward when it tries to handle stuff like “Beloved means one who is loved” and “Loveless means one without love”. That “Just because you’re correct doesn’t mean you’re right” line was originally お前の正しさはただ正しいだけのものだ. That translation is already a heavy rewrite, and while you can sort of see what they were going for, the fact that it sounds awkward as hell has absolutely nothing to do with the issue the article is about. Thanks for the info, that helps a lot. Japanese text dumps are much rarer than their English counterparts, but FF5 is big enough to have a few floating around. Try searching ファイナルファンタジー5 セリフ. That’s exactly how I took it as well, and as a non-native speaker it doesn’t even sound that clunky to me. It sounds like something a plucky shounen protagonist would say. Not the most elegant, but straight to the point. Yeah, it would sound maybe best if written “That may be true, but that doesn’t make it right”. 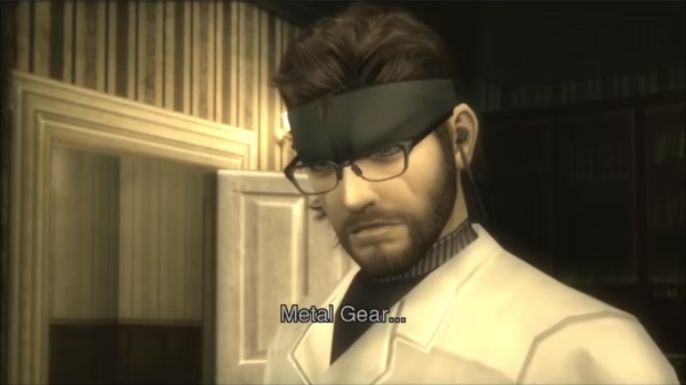 You previously covered an example of this in Metal Gear Solid 3 in “How the “Metal Gear” Name Is Explained in Japanese”. This made me remember the Knife Edge Deathmatch scene from Yu Yu Hakusho. That scene is also a very popular meme in its Latin American Spanish version. The term was translated as “duel to the death with knives”, and the last line reads “I’ve never seen nor heard anything like that. I think they’re going to fight with knives”. There’s also a fourth solution: to hang a lampshade on it, as in the example you’ve covered here: . Haha, good call! I hadn’t considered it because I see it more as a desperate cry for help, but yeah, it’s definitely a solution. 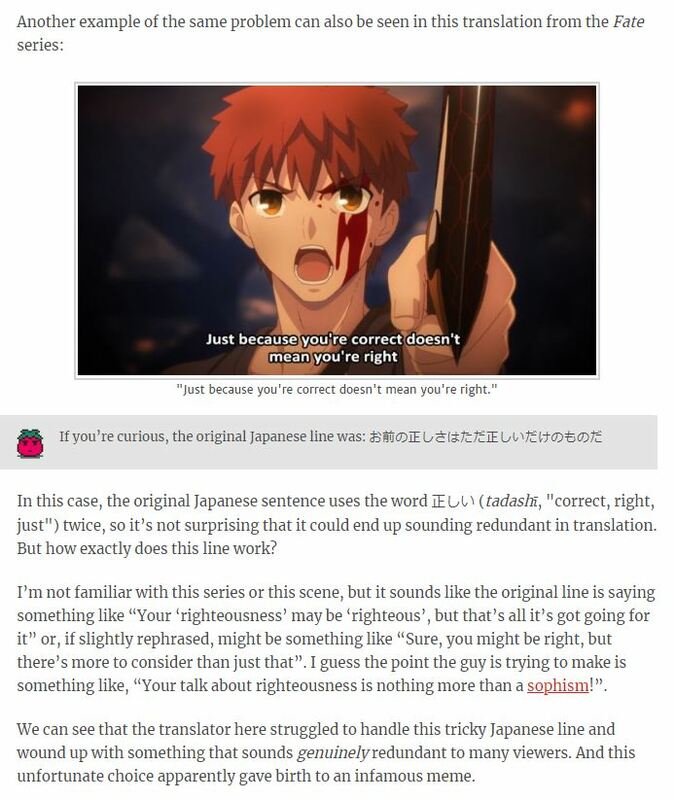 “Just because you’re correct doesn’t mean you’re right” could be taken to mean “just because you’re correct doesn’t mean you’re MORALLY right”, but your description of the Japanese line makes that interpretation seem unlikely. Yeah, I think that’s how the translator (mis)interpreted from the Japanese too, which is why it wound up the way it did. @”Just because you’re correct…”: There HAVE been times where people criticise a translation because of a stupid line, only for it to turn out the line was just as stupid in the original version. Oh, absolutely. I’d love to cover that topic too, but I’m having trouble recalling any specific examples at the moment. 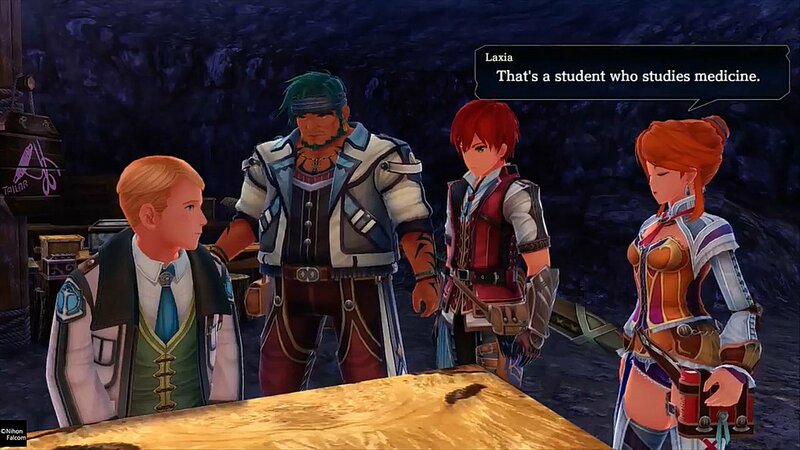 The only tangentially related thing that comes to mind at the moment is the dub for Star Ocean 4, which I felt was pretty similar to the original voice acting. Wouldn’t the graveyard duck qualify? Most people assume it’s a mistranslation, when we now know it’s just the developers screwing with the player. I think that one’s mostly derived from the myth that “Castlevania 2 was so badly translated they put a line in the manual about how some townspeople lie to cover it up”. Doesn’t really help that the game IS full of horrendous English and several actual mistranslations, so if you don’t know Japanese, it’s a bit hard to tell exactly what’s meant to be misinformation and what’s just mistranslated. Doesn’t help several are without context. “You should be able to solve this” (a capture from the original Pretty Cure series) is a pretty famous one, but the whole point of the scene is the teacher DID write the question down wrong and make it unsolvable by accident. Kinda like the “is this a pigeon?” meme, where the person saying it is an alien unfamiliar with Earth. 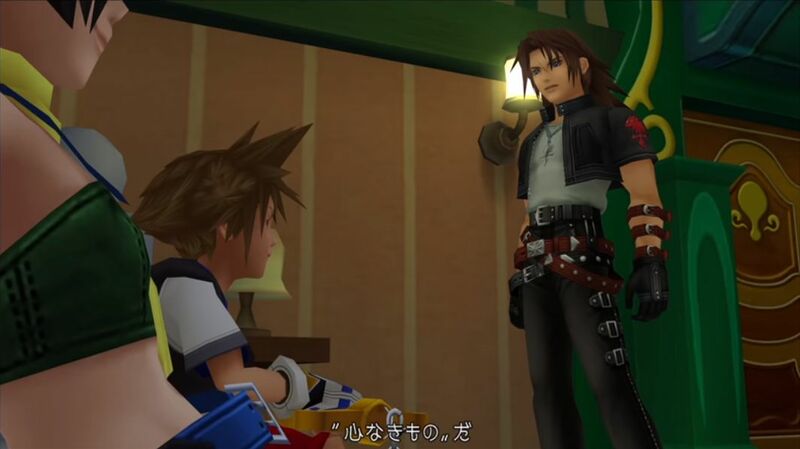 I’m glad the Kingdom Hearts line struck such an interesting article! Glad you enjoyed it! Going off memory here, but there was an episode of Full Metal Alchemist Brotherhood that had a situation similar to the Kingdom Hearts example above. In the series there are 7 Homunculi, each of which are named after the 7 Deadly Sins, and in Japanese their names are rendered in English with a Japanese pronunciation (examples: Gluttony becomes “Guratonii,” Wrath becomes “Raasu,” etc.). Anywho, the example pertains to the episode in which Hoenheim first encounters Pride. After Pride introduces himself, Hoenheim’s following dialogue essentially provides a translation of the name in Japanese. In the fansub of this scene, Hoenheim’s dialogue is translated to the effect of “Pride… vainglory, huh?” I personally thought it was an impressive choice, as a direct translation would have likely resulted in a redundant usage of the word “pride” multiple times in English. 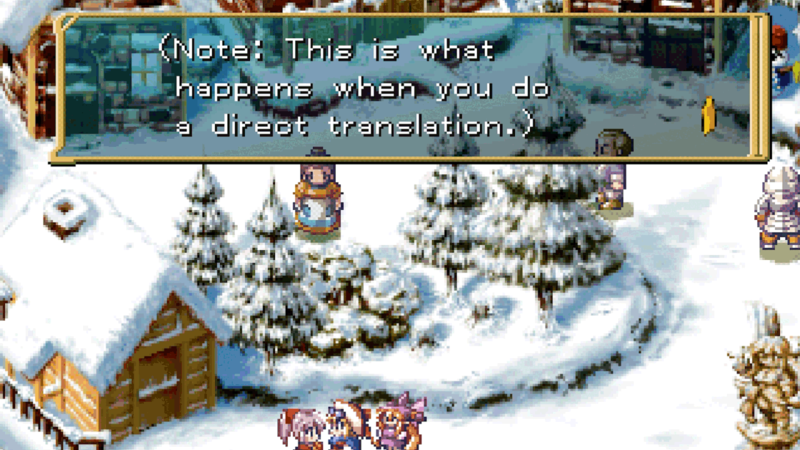 Instead, the fan translation chose to utilize a synonym so that the dialogue read more smoothly. 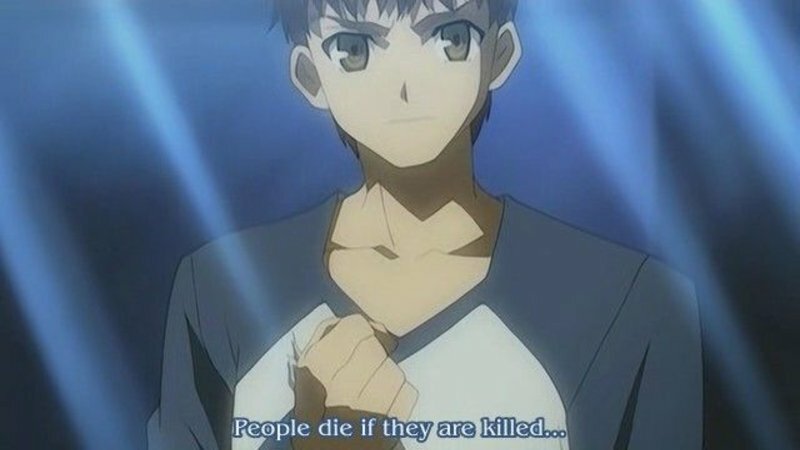 If I remember correctly, the “People die if they are killed” line from Fate/Stay Night is actually a fine translation. It’s supposed to sound dumb and obvious, and the point is that the fundamental truth of how permanent and irreversible the consequences of the Holy Grail War are has truly been driven home in him, where it didn’t really feel real to him before. It sounds dumb and redundant out of context, but in context it makes sense. I mean, Shirou’s just an obvious kind of guy. He’s great at cooking and swords though. 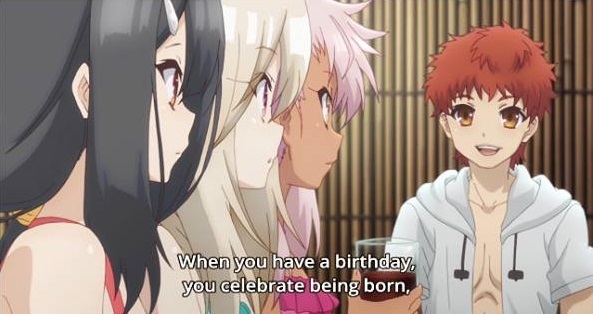 IIRC the “birthday is the day you’re born” line is not a mistake but a joke too. Even though it make sense in context, the Mirror Moon translation is pretty clunky and probably should have translated that differently. And watching the Mato’s LP of FFVI makes that a lot more obvious to me. 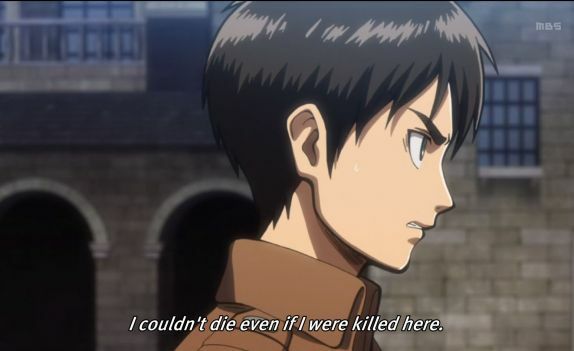 So basically, he’s realizing that if you die in the Holy Grail War, you die in real life. SCEA’s localization team at the time was just dreadful, really. That seems more like a case of stating what it is rather than redundancy. A globe isn’t necessarily stone, and it’s big in size. It’s more akin to a large stone than an actual globe. Globe is just a fanciful way of referring to it due to its shape and rotating structure. “Just because you’re correct doesn’t mean you’re right,” is at 21:35 of episode 20 of Fate/stay night: Unlimited Blade Works (2010) (http://www.crunchyroll.com/fatestay-night/episode-20-unlimited-blade-works-664487), which might clarify the context there. More spoiler-y context for that scene is in the website link. 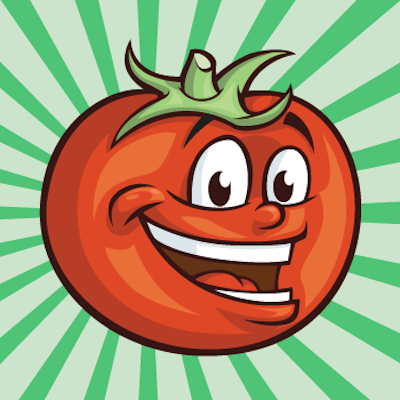 Gur juvgr-unverq thl vf gur erqurnq sebz gur shgher, gelvat gb pbaivapr uvf cnfg frys gung orpbzvat na nyyl bs whfgvpr vf n cngu jvgu ab erjneq. Illusion of Gaia is horrendously badly translated in the first place, with a lot of the more complex stuff towards the end getting turned into incomprehensible nonsense in the translation. Yeah, I have always IoG to get a more professional translation done so that they story didn’t read like utter crap after a while, but they never went back this classic lost title. So there are a few things going on here. 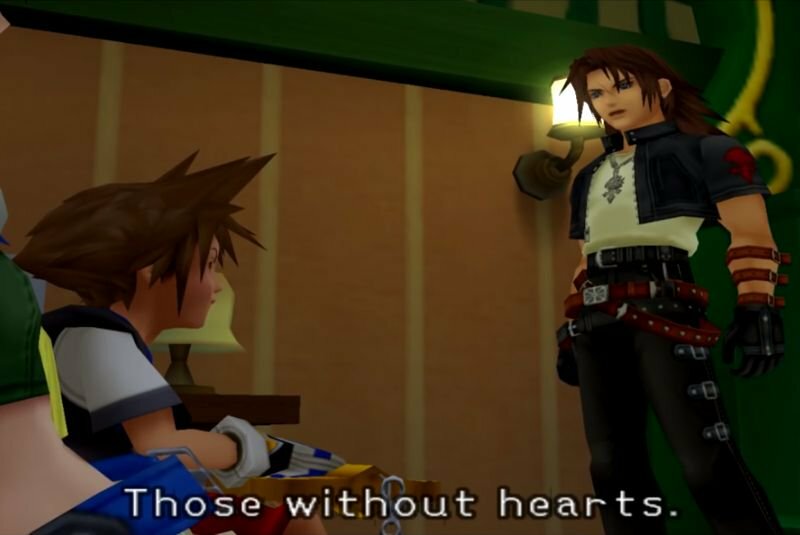 One is that Will and his transformations being associated with darkness is a thing in the game, and so darkness inevitably comes up a lot when talking about powers. 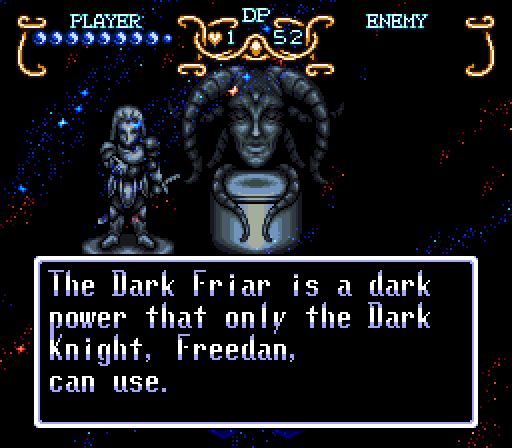 Dark Power, Dark Knight, and Dark Friar are all terms that are repeated. The other thing is the mixed language bit: you’ve got the katakana English “daaku furaiyaa” along with “yami no senshi” and “yami no chikara”. Looking back, I feel I did a poor job with the second Fate example, which greatly distracted from the main point of the article. With that in mind, I’ve taken the example out but have left a note in its place with a link to the original example for anyone who’s curious. 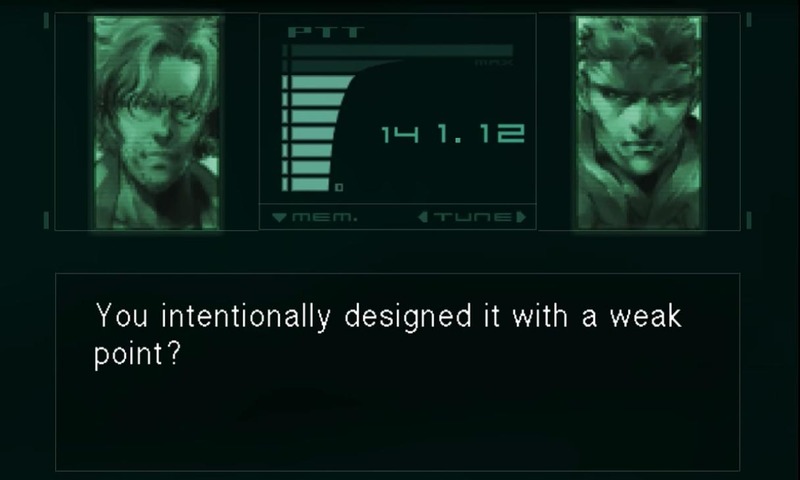 Now that I think about it, it also seems to be one of those famous lines that probably deserves a dedicated analysis anyway. Plus I wonder what Japanese fans think of it too. The reason there’s so many Fate examples is because the first one became such a meme that fan translations deliberately translate lines poorly so people will be like “Wow! There it is again!” Like the one about archers isn’t even an overly literal translation; it’s the translators deliberately phrasing it to make it redundant, because they think it’s funny. In this case, it’s just that the Japanese words for “school” and “festival” aren’t in the Japanese word for “school festival”. Don’t pin this one solely on the fans, please. Both the “Archer class made up of archers” and the “Just because you’re correct doesn’t mean you’re right” lines are from the official Aniplex subs for Unlimited Blade Works. I was the editor for the UTW fansub of that show and we had something like “So you really *are* an archer!” and “Being correct isn’t everything” for those lines respectively. 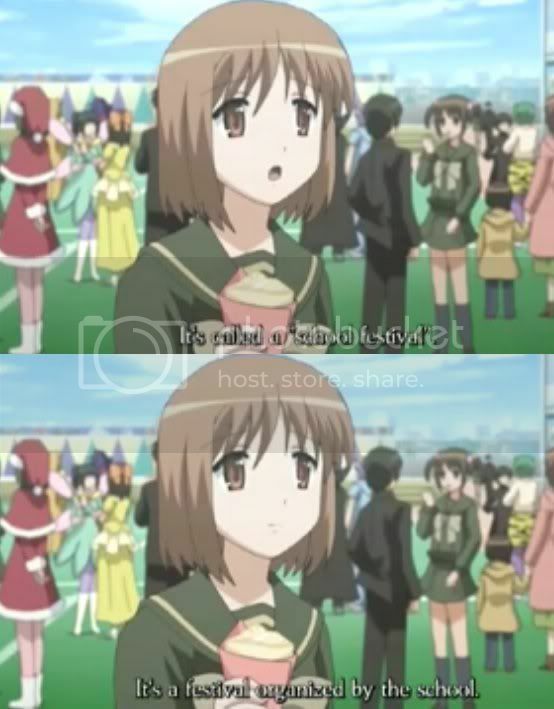 There’s incompetence all over the place when it comes to anime subs, unfortunately. Ah, I remember one of these from Kamen Rider W! The villains in that all have powers derived from an English word, with a form and abilities related to that word’s meaning. You would think that would make for LOTS of these kinds of redundancies, but I believe there was only one instance of it happening. The heroes cornered the villain with the “Liar” power, and one hero explained to the other how it had the ability to influence people’s minds. The second hero responded by using the Japanese word for liar, “usotsuke”. This being fan subs, a translator’s note was used to clear up the issue, but considering the tone of the scene and the playfulness of the way the line was delivered, it wouldn’t have been a huge issue either way. 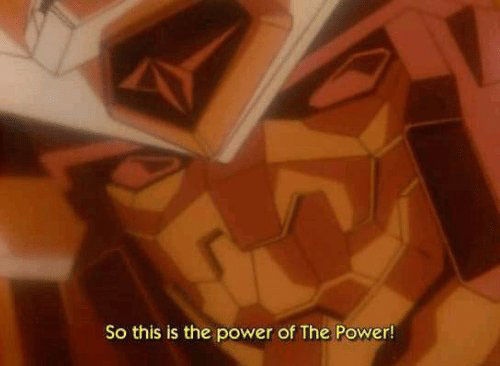 I just wanted to note that the Gaogaigar screenshot reminds me how much I love Gaogaigar. 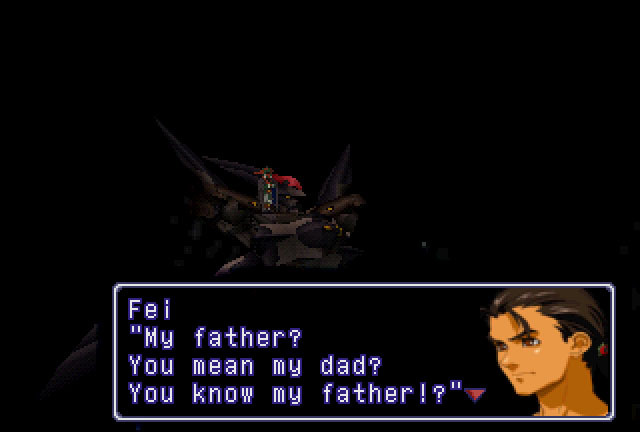 Fei is expressing surprise/disbelief that Grahf apparently knew his father, he is not confused as to what 父親 means. I thought Mato understood that. It’s not about the character misunderstanding, but the audience. The awkwardness is in the “My father? My dad?” part being redundant to the audience as those words mean the same thing, so only one really needs to be said. By the sound of it, you’re correct in that it’s not the same kind of “translation issue” he was talking about (reusing English words because they’re English in the Japanese version), but you misidentified his issue with the line. In Detective Conan, “DETECTIVE BOYS 少年探偵団” is rendered in the subs as “They say ‘Detective Boys’ since we’re the Junior Detective Club” – but I suppose that’s more like a matter of terminology forced by the studio leading to an awkward translation, as opposed to actual redundant translation.